Due to the size and surprising nature of this study, we will present it to you in various instalments accompanied by cartoons from our beloved Xufarella (The Horchata Times), starting in March 2016. Here’s a sneak peak of the “Introduction” to the study “The world of the tigernut and horchata. Past, present and future”. 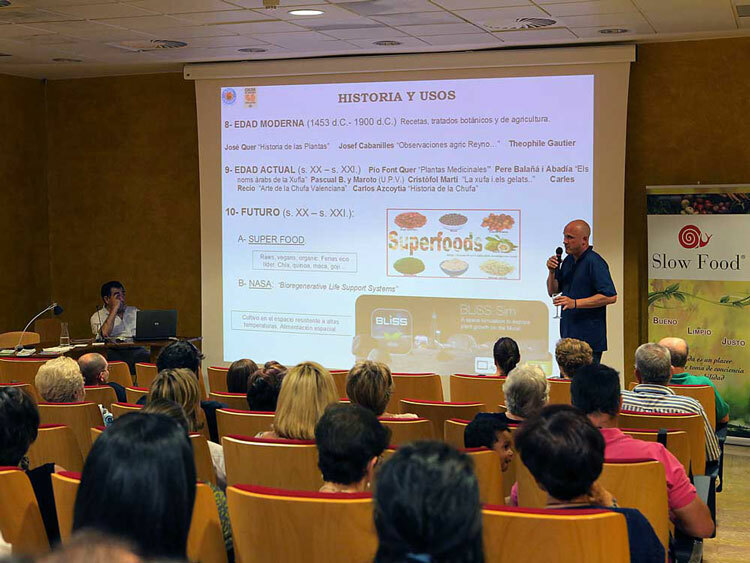 In the year 2014, the SLOW FOOD movement asked MÓN ORXATA (Horchata World) if we could give some talks on the tigernut and horchata. We accepted the challenge and this meant that we had to gather and bring together our knowledge, which then led to the work which we have included below. Summarising millions of years of history regarding the exciting, but unknown, tigernut, is not easy, but here it goes!! This study is the fruit of many sleepless nights, researching, having fun, finding some answers and leaving the others to common sense. In spite of a Western world which is advancing quickly, obsessed with money, globalisation and transnational brands to the detriment of local artisan products; and before the very passing of time – this Time with capital letters which will even end up forgetting Cesar and Cleopatra – wipes out any trace of the tigernut in history, we have felt happily obliged to rescue small scraps of information about it, scraps that well sewn together make a beautiful dress which we would like to give to you. Special thanks for inspiring us go to Carlos Azcoytia. To the small-scale farmers who respectably grow tigernuts in Valencia and throughout the world. To our beloved horchata sellers and the team at Món Orxata. You’re the best! And, of course, to the great horchata lovers with whom we have exchanged our knowledge and passion, like the journalist Carles Recio, the Belgian horchata maker who has “disappeared” to Brazil, Guy Passek, the Vargas Family of the Museo de la Horchata, the families from Horchatería Fabián, La Casa de l´Orxata, Rin, Subies y Carroxata, the Pastor brothers, Vicent and Cristobal, the scientists from the CSIC (Sociological Centre of Scientific Research), Jose Luis Navarro and Pepe Carbonell, the Director of Nutrition at Universidad de Valencia, Carlos Soriano; or more briefly with the old, wise man of “l´horta” (the vegetable garden), Cristofol Martí, the horchata maker, José Ramón Panach, the innovator and social promotor, José Benlloch of Sequer lo Blanch, the tigernut family, the Greses, the tigernut cooks, Josep and Leo from XufaCity, the horchata-making Soler family, the marvellous Head of the Digestive Department in the Arnau Villanova Hospital, the excellent Doctor Bixquert (a doctor who, although we do not know him personally, we feel close to), etc. And we apologise to all those who we have forgotten to mention due to our terrible memory. Thanks and good wishes to the anthropologists, archaeologists, botanists and the rest of the scientific community, whose work allows us to better understand who we are, where we come from, and the disastrous future which to we are directly heading if we do not dramatically and generously change the human race’s unsustainable way of life. To Pope Francisco for vehemently and clearly reminding us of this in his immeasurable encyclical. We would also like to mention the Protected Denomination of Origin, “Chufa de Valencia”, which, under a European guarantee ensures that this ancient Valencian tradition remains alive. Finally, we would ask that those people who wish to freely use this material, please make a mention of us in their bibliography or through links, in the same way that we always do with others’ work in our blog “plantmilk.org” or in Món Orxata. Thank you. Enjoy it, dear lovers and freaks of the tigernut and prepare yourselves for…. an intense trip! !